I lived in a Plotland bungalow named ‘Westholme’ in Sidney Road off Victoria Road Laindon from the late 1940s to 1970 with my parents William and Ivy, who had moved in just after the war. My father also purchased property in New Century Road (Willowdean) which he rented out for a time before selling it. I could never really understand why we did not live there because New Century Road was made up and Sidney Road was not. My mother was originally from Ilford and dad from Hinckley, Leicestershire. My grandparents Robert and Edith Bradford lived in another bungalow opposite Westholme named ‘Hazelcott’. 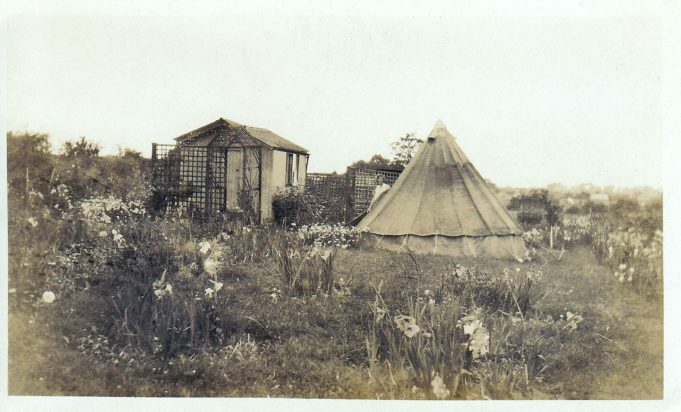 They used to go down every week and live in a bell tent while Hazelcott was being built. There were about five other bungalows in the road. 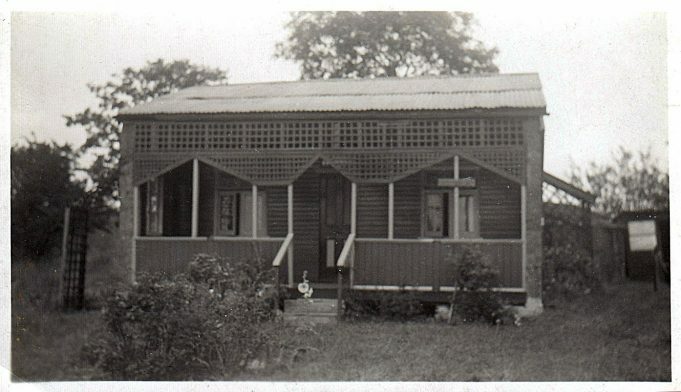 Our bungalow had two bedrooms, a main room which we only used when we had visitors, a sitting room with a coal fire, scullery and a small extension off it where my mum did most of the cooking. The walls of our bungalow were made of asbestos. There was no electricity but we had gas for cooking and lighting. We mainly burnt logs on the fire and I spent many an hour cutting logs for my parents. I had a sawing horse, two saws and one A&E (wood axe) for splitting the logs. Clothes were washed in a copper boiler and then put through a mangle in the garden. We had a well for water, those that didn’t could get water from a stand pipe in Victoria Road. I can remember clearly toasting bread with a toasting fork and roasting chestnuts on a small shovel over an open fire. We had a meat safe to keep the flies off, no fridges in those days. Most people had large gardens compared with today and they grew their own vegetables and kept chickens and rabbits. We had 11 fruit trees in our garden and my grandparents had even more. Our road and many others were unmade but the owners all got together and built concrete paths along the side of the roads otherwise they would became impassable during the winter months. The winters seemed to be worse than they are today and the snow much heavier but everybody would spend an hour or so clearing the snow outside their own property and then put ash down from the coal and log fires. Winter grit was unheard of. We had to scrape the ice of the inside windows, there was no such thing as double glazing or central heating. My grandparents used to take me to the Fur and Feather Society shows at the Dunton Colony where they won many trophies for their exhibits. My grandparents were President and Vice President of the Society. 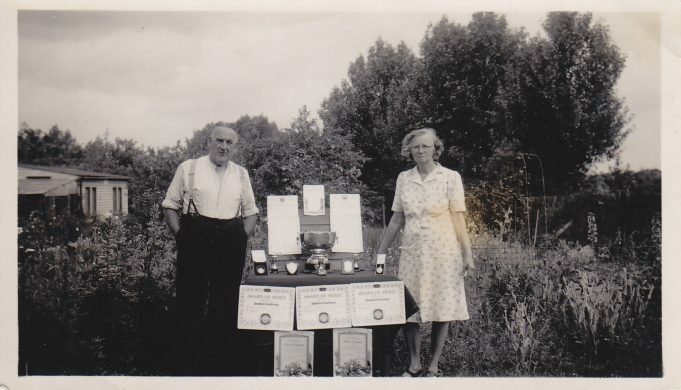 The society was the forerunner of the Laindon and District Horticultural Society that now hold their meetings and exhibit out of the Laindon Community Centre. I started at Markham’s Chase School in 1954; I walked all the way from Sidney Road which was approximately 2 miles, later I rode to school on a bike. I remember the sweet shop opposite; I believe it was called Lawrence’s. I left in 1960 and went to Laindon High Road School. Mr Woodward was the headmaster; Mr Munday was the PE teacher and Mr Cluff the science teacher. During the 1960/70s the school canteen was used as a youth club run by Mr Munday and his wife. I joined the Life Boys at the old Baptist church in Langdon Hills and later the Boys Brigade at the Baptist Church. Once a month we would have Sunday school parade and during the summer we would go up into the woods and practice tracking. I used to go to the Laindon cinema on a Saturday evening, unlike many of my friends who went to the Saturday morning shows. The cinema was in the High Road at the junction with New Century Road where Laindon library is today. On the opposite corner was a sweet shop and café run by Tom Griffen who lived at 29 New Century Road with his wife and two daughters. David on his bike with Hazelcott in the background. 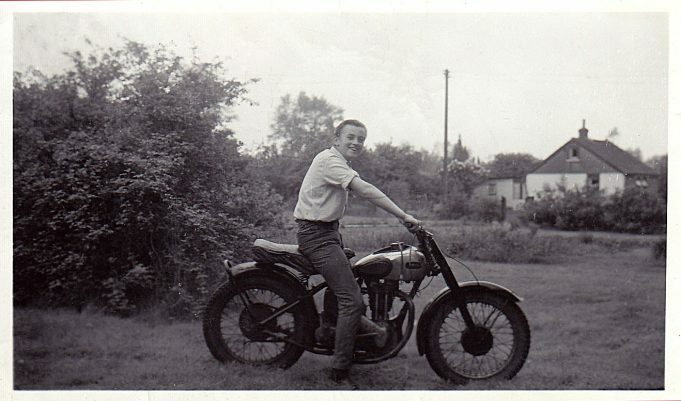 When I was 16 I bought a motor bike from another boy in Laindon – Ariel 500 – it had been stripped down and was only useful for riding around the fields. Unfortunately one of my cousins pushed it too hard and it caught fire. Later in 1965 I purchased a BSA C15 for road use. There were at least a hundred shops along Laindon High Road from the Fortune of War to the other side of the railway line into Langdon Hills. Most people tended to walk or bike to the shops every day, there were not many cars around, people just did not have the money. The shops opened from 9am to 5pm, half day closing was on Wednesday. Shops were all closed on Sundays. The pubs open 6pm until 10pm and on Sundays 12 noon to 2pm then 6pm until 10pm. My parents and grandparents homes were compulsory purchased by the Basildon Corporation in the late sixties and my parents bought a house, number 67 New Century Road, where I live today. I started work in 1964 as an assistant lorry driver for S. Wernick & Sons of Radford Way, Billericay and was paid 1 shilling & 7 pence an hour (£3.10 shillings a week – todays money £3.50p). When I first started work you could leave a job on Friday and start a new one on the following Monday; there was no mass unemployment like today. I married Helen Margaret Dellar, (a Laindon girl) at St Nicholas Church in 1975; my parents were married there in 1947. Because my parents owned their own home we were not considered by the corporation as second generation and we had to rely initially on the council to house us. My grandmother, Mrs Edith Bradford proudly celebrated her 100 birthday on the 27th May 1983. I wonder, whether the generations that followed us with more money could have survived with less. Could they have managed with no running water, no flushing toilet just a bucket at the bottom of the garden. Toilet paper being squares of a newspaper, hanging on a nail. The tin bath in front of the fire, the water being boiled in a gas copper – I wonder? Laindon during the 1950s was a pleasant village, where everybody knew everybody else and plenty of freedom for the children – those were the good old days. These ramblings are in memory of my mum Mrs Ivy Blaine, my dad Mr William Blaine, my grandma Mrs Edith Bradford and granddad Mr Robert Bradford. I will always miss them. David Blaine writes of their bungalow as having “a main room which was only used when we had visitors.” I think this was true of almost everyone in Laindon. It was certainly true with my family. Whether this was a national custom or just a local practice I know not. Our “front room” as we called it was only used at Christmas, when we had the occasional family visitor from outside of Laindon, or upon a death in the family. In the last instance granny (or whoever) rested in her coffin in the front room surrounded with flowers and awaiting final well wishers and visitors before transportation to her final resting place. How strange that in such modest and tiny bungalows the best and largest room should be reserved for very infrequent use and only on special occasions. In retrospect a very odd custom. I wonder how and why it came into being? My grandmother, Martha Fowler, lived at “Grandene” which I recollect was on the corner of New Century Rd and Laindon High Rd. She had six daughters, that she dressed identically, and two sons. They were moved when the council purchased the property to Kathleen Ferrier Crescent. I remember, as a child, spending many happy hours playing in the orchard among the apple, pear and plum trees. My mum and dad were married at St Nicholas Church on the hill. After many years of our family moving away from the area my daughter and her husband-to-be have purchased a flat almost on the site of the old Fortune Of War pub and can see the church from their kitchen window. Great old days! Editor: Indeed it has Christine and it continues to change! It would be very interesting to hear your views on the changes since you lived here.